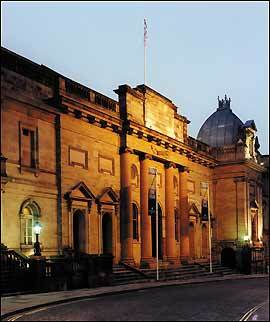 Are the Galleries Of Justice in Nottingham haunted? The Galleries of Justice is a museum of crime & punishment, which is housed in a building called "Shire Hall" in the Lace Market area of Nottingham. The courtrooms date back to around 1375 and the prison section to 1449, a police station was opened next door in 1905. In fact Tim Desmond (Chief Executive of the Galleries) said it's "the only site in the country where you could be arrested, sentenced and executed." Existing records show that 21 hangings took place from 1738 to 1799, mainly for robbery and murder. With all the executions, punishment and sorrow the building will have seen of the past few hundred years, you'd expect there to be a fair few ghost stories, right? The tales start right at the main entrance; mediums have picked up on three difference spirits, a Victorian gentlemen, a soldier and an unidentified woman. Also felt in the doorway are sudden temperature drops and banging noises. Many of this activity is due to the fact that executions used to take place right outside the main entrance. It's said that the most haunted section of the building is the chapel. People regularly report a cross being hurled across the room, but there are also reports of people being hit by stones... Other terrifying places are the pit and the condemned man's cell, if you're feeling brave you'll be pleased to know tours are available through all these areas! Pictured above: Photo of a white lady caught on camera in September 2008? The employee that had taken this picture was compelled to buy a camera after seeing a strange floating black object and was unable to capture it on film. This picture was taken during the caretaker's rounds at night in the dark. The flash went off, but nothing was seen with the naked eye. Imagine how he felt on seeing what had been captured on camera!